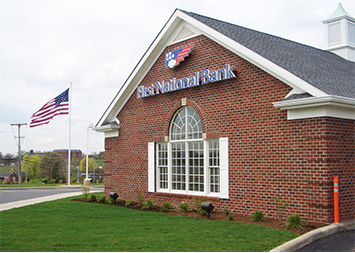 First National Bank provides several dependable commercial banking, consumer banking and wealth management solutions in Youngstown, Ohio. Our reliable staff is ready to assist you with all your banking needs. Visit this branch at 1 W Federal St or give us a call today at 330-747-0292 to learn more about our convenient banking services near you. This First National Bank branch in Youngstown, OH is located at 1 W Federal St, and offers a 24-hour ATM for your convenience. For help with any of your banking needs, please stop in during normal business hours and speak to one of our friendly team members. Need after-hours banking? Access our ATM to make deposits, withdraw cash or check your balance. Founded in 1864, FNB provides a full range of commercial banking, consumer banking and wealth management solutions. If you are coming from near Churchill, OH, head south on Belmont Ave and merge onto I-80 W. Use the left lane to take exit 228A to merge onto OH-711 S toward Youngstown. After 1.1 miles take the Gypsy Ln exit toward US-422/Youngstown and turn right onto Gypsy Ln. Turn left onto Martin Luther King Jr Blvd and continue for 1.6 miles onto W Federal St/Martin Luther King Jr Blvd. Turn right to stay on W Federal St/Martin Luther King Jr Blvd. Turn left to stay on W Federal St/Martin Luther King Jr Blvd and continue for 0.7 miles. Arrive at First National Bank (1 W Federal St, Youngstown, OH 44503). If you are coming from near Boardman, OH, head north on Market St toward Boardman-Canfield Rd for 5.4 miles. Make a slight left to stay on Market St and then Market St turns left and becomes W Federal St. Arrive at First National Bank (1 W Federal St, Youngstown, OH 44503). If you are coming from near Campbell, OH, head northwest on Wilson Ave toward 6th St for 2.5 miles and turn left onto Federal Plaza E. Continue straight to stay on Federal Plaza E and then continue onto W Federal St. Arrive at First National Bank (1 W Federal St, Youngstown, OH 44503). If you are coming from near Austintown, OH, take OH-46 N/N Canfield Niles Rd to the Interstate 80 E ramp to New York and merge onto I-80 E. Keep right at the fork to continue on I-680 S, follow signs for Youngstown. After 6 miles take exit 6B for Market St toward Downtown and turn right onto Market St. Market St turns left and becomes W Federal St. Arrive at First National Bank (1 W Federal St, Youngstown, OH 44503).